Finding the best dog food for Papillons is not an easy task. There are thousands of pet foods to choose from and so many that claim to be the best. Some owners assume that the pet food sold in grocery stores will provide the optimum nutrition for their dog but this isn't always the case. With so many brands out there to choose from it can get overwhelming which is why we have analyzed and complied a list of the top rated dog foods for Papillons. We have carefully selected these brands based on their nutritional value, ingredients used, recall history, cost and reviews from other dog owners. So let's delve in! What to feed a Papillon? Papillons are meat eaters: being descendants of the carnivore wolf, they should eat meat. Good cuts of meat supplemented with whole foods like vegetables and easy to digest carbohydrates such as sweet potatoes, lentils, chickpeas and other beans. Pap breeders recommend ingredients like lamb, chicken, wheat and corn because that's what a Papillon's ancestors would have eaten in the wild. The closer you stick to the above recommended ingredients, the better the health of your Papillon and fewer trips to the Vet. 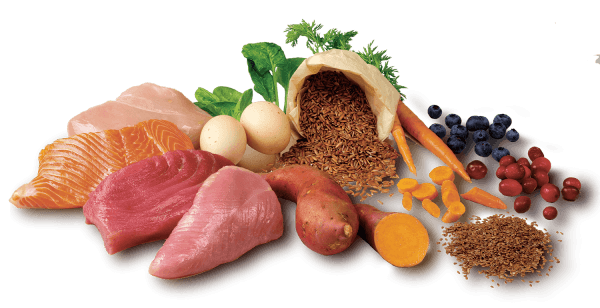 In terms of carbohydrates, protein and fats, these experts recommend foods with a high carbohydrate to a high protein ratio, but choosing complex carbohydrates are easy to digest. A Pap's diet should have moderate fats for healthy brain development. For less active Papillons an average protein base of at least 21% is recommended and up to 26% for very active Papillons. Since Papillons often suffer from joint problems, arthritis in their senior years and issues with their teeth, owners should find dog kibble that addresses these particular issues. Senior dog food recipes should contain glucosamine chondroitin for joint support. Avoid wet or canned food since this can cause havoc on their their teeth and gums, as well as diarrhea and overall poor health. Obesity is another issue with Paps, so don't feed leftover people food and doggie treats since these are dense with calories and are laden with high levels of carbohydrates, sugars and fats. Instead choose homemade treats such as small pieces of fresh or dried apple of pears, small pieces of fresh veggies such as broccoli or carrot sticks. A male Pap should weigh 8 to 10 lbs, while females Papillons should come in between 7-9 lbs. Both underweight and overweight Paps are at risk for certain health concerns such as arthritis, breathing and heart problems. Many breeders and vets recommend a BARF (Biologically Appropriate Raw Food) diet for Papillons. A BARF diet can be fed to both a puppy or adult Pap. It's fed based on a percentage of a Pap's weight at a recommended rate of 2-3% off the total body weight. These can be purchased - frozen or raw or be prepared at home. Here are the main ingredients that are ideal for a Papillon if you're a supporter of the BARF diet. Offal (internal organs such as kidney, tripe, heart and liver). Veggies (most vitamin and mineral providers are: broccoli, spinach, carrots, celery, bok choy, and capsicum). Fruits (pears, oranges, grapefruits and apples). Garlic, kelp, flaxseed and other essential nutrients. 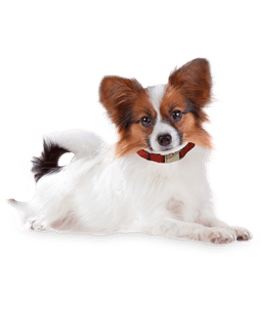 If you don't have the time to raw feed your Papillon, a high quality, dry food is recommended for most Papillons and is often reasonably-priced and affordable. It can be overwhelming to select a food so we followed these basics and narrowed down our choices. These foods contain - lots of whole foods, complex carbs, nutrient-dense ingredients and have ample high quality, bio-available proteins that are suitable for a Papillon's smaller body and digestion. First Five Ingredients: Deboned Chicken, Chicken Meal (Source of Glucosamine), Brown Rice, Oatmeal, Barley. 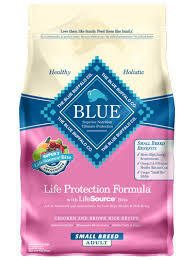 Blue Buffalo Life Protection Formula Small Breed Adult Chicken & Brown Rice Recipe is a great option for Papillons since it contains no gluten or artificial preservatives and the kibble is coated with probiotics to support your pal’s digestive health. This holistic dog food was specially made with the health of small dog breeds in mind, so owners can be confident feeding it to their cute little Papillons. Not only does this Blue Buffalo avoid ingredients associated with allergic reactions in most dogs, they also use smaller kibble that is good for small mouths and helps with tartar removal. Blue Buffalo knows that even though a dog may be small, doesn’t mean that it should be underestimated. That’s why they included healthy ingredients like deboned chicken, potatoes, and peas to help little dogs stay lively, playful, and active. This recipe also uses glucosamine to support healthy joints and Omega 3 and 6 fatty acids for healthy skin and coat. This formula offers 26% crude protein and 15% fat, with only 397 kcal/cup - best suitable for active Papillons. Dog owners who switched their pets to Blue Buffalo notice a lot of positive changes, like shinier coats, more energy, and better digestion. Blue Buffalo is also a recommended brand for ﻿﻿﻿dogs with sensitivities and aller﻿﻿gy issues. Even the pickiest dogs love Blue Buffalo, and their owners love feeding it to them because they know they can trust the ingredients sourced by this brand. Since this dog food is dense in nutrients dogs don’t need to eat as much of it, which saves them from weight problems down the road and saves you a little money. We rate this dog brand among the top for nutritional value and cost. Plus your Papillon will love you for it! Here’s an excellent option from the Wellness brand. 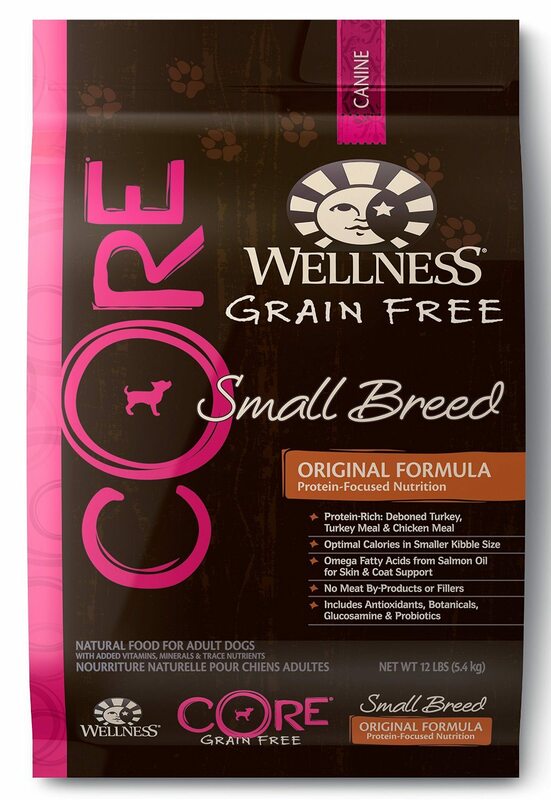 Wellness CORE Grain-Free Original Formula is protein rich, with deboned turkey, turkey meal, and chicken meal as a few of its main ingredients. This complete adult formula uses meats that are easy to digest, making sure that dogs get the most out of the nutrients in their food. Wellness CORE’s recipe is fortified with probiotics to help with digestion and doesn’t contain any of the usual ingredients in other dry dog foods that trigger allergic reactions. This recipe contains high levels of protein - 36.0% crude proteins and 16% crude fat, but still low in calories at only 396 kcal/cup. One of the things that sets Wellness CORE apart as a high quality dog food brand is Yucca Schidigera extract, an ingredient used to help reduce odor in dogs’ stool. Their recipe also includes glucosamine for healthy joints and antioxidants to support better immune health. Owners can feel great feeding their dogs this food, since it contains wholesome ingredients like kale, carrots, apples, spinach, broccoli, and ground flaxseed. 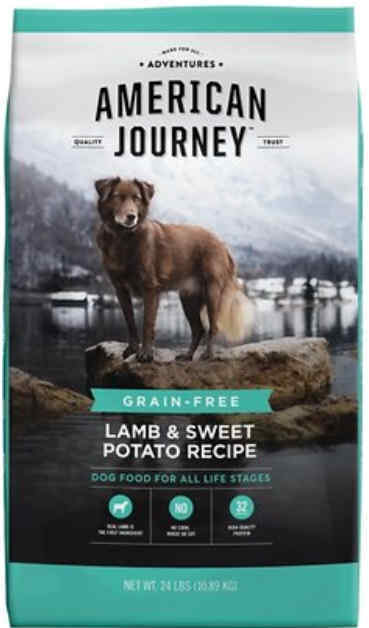 The thing I like about this food is that even the most pickiest of dogs really seem to enjoy Wellness CORE’s Grain-Free Original Formula and that it is a good choice for dogs that suffer from allergies. This highly recommended brand has helped several dogs get over their digestion issues and improve their energy levels. Pet owners love the ingredients in this recipe and the fact that it is grain-free, with no fillers making a very good choice of dog food for your Papillon. 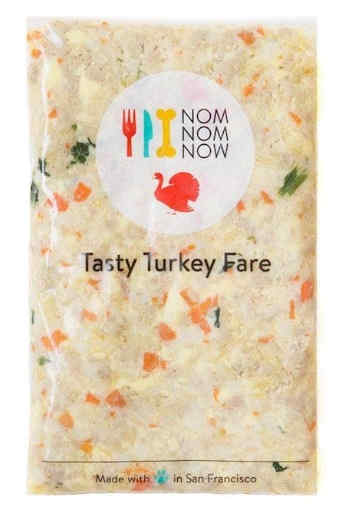 First Five Ingredients: Deboned chicken, deboned turkey, atlantic ﬂounder, whole eggs, whole atlantic mackerel (source of protein and B vitamins, particularly vitamin B12). 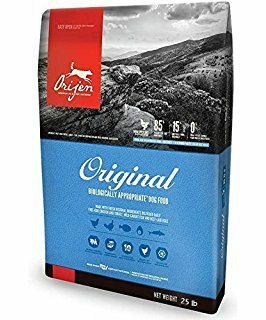 Orijen Original Grain-Free Dry Dog Food is made with ingredients that dogs were always meant to eat. This recipe includes free-run chicken and turkey, fruits and vegetables, whole eggs, and wild-caught fish. It is a dog food that was made with all dogs in mind, regardless of their size, breed, or age. Orijen has everything a lively Papillon dog needs to live a happy healthy life, and owners can even feed it to their other dogs if they have more than one breed at home! This is an all life stages formula, suitable to feed a Papillon puppy or adult. Orijen’s Original Grain-Free recipe includes 85% premium animal ingredients and 15% fresh fruit and veggies, which is what we are looking for. The only downside to this food is that's a pricier formula that most other dog foods but well worth the investment if the budget permits. This USA made dog food brand also has edible bone as its source of calcium and glucosamine, which supports joint health without adding harmful artificial ingredients. Licorice root is included for healthy digestion and cranberries and blueberries provide a great source of antioxidants. All of Orijen’s ingredients are sustainably sourced and GMO-free, something that is not always easy to come by these days, so that's a big bonus! 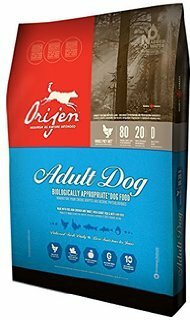 Dog owners love feeding their pets Orijen dry dog food because they trust the brand and see the difference in their dogs after they switch to it. Not only are dogs more eager to eat when they are fed Orijen, owners also notice a difference in their digestion, the quality of their coat, and their dog’s overall energy levels. Vets and owners recommend this brand to owners looking to feed their dogs high quality dog food with the best ingredients for their pet’s overall health which is why we rank it as the best food for Papillons. We wouldn't recommend Hill’s Science Diet or Pedigree brands as these are not rich enough in nutrients, lack sufficient quality meat proteins and have excess corn or are carb-filled which are hard to digest and lack nutrition. Standing between 8 and 11 inches high and weighing a mere 8-10 pounds these dogs look extremely delicate but, don’t let their looks fool you they are extremely hearty dogs who have few if any major health problems as a breed. The Papillon dog’s normal personality is one of a happy, friendly nature who gets along with other pets and animals and is loving, affectionate and extremely devoted to their owners. They are not however, what you would consider to be a traditional lap dog as they love to run and play and be challenged intellectually. These dogs are quick learners and exceptionally easy to train if one is consistent with training and take well to both obedience and agility training and love the mental stimulation that both of these types of training supply. They can also be taught all kinds of tricks simply and easily and actually love the challenge of learning new things. They are also extremely energetic little dogs that will keep you smiling at their antics but, do need an average amount of exercise. They love their walks and need them as well as playtime in order to stay calm and happy when in the house. While these dogs love to run and play they prefer to do so in the company of their human family and become very attached and loyal to those they bond with. Eye Problems namely cataracts, Progressive Retinal Atrophy (PRA) and distichiasis. Papillons make great companions, often cheering up their owners with their cute antics and playful personalities. Owners who want to keep their Papillons in good health should buy them high-quality dry kibble like Orijen, Blue Buffalo or Wellness CORE. All of these dog foods are grain-free and use responsibly sourced ingredients that owners can feel confident feeding their pets. A high protein, nutrient rich diet is a great way to maintain a Papillon’s health, avoid health issues associated with the breed, and support their spirited personalities.